Americans are fairly satisfied with life in their local communities today, but their level of satisfaction varies widely according to how attached they feel to their community and the strength of their social connections. Older adults tend to feel more satisfied with their communities and more attached to them. Young adults are more restless and mobile. About four-in-ten U.S. adults live in or near the community where they grew up. And for many of them a desire to be near family is what has kept them close to home or brought them back. Rural adults are more rooted in their local communities than are urban or suburban residents – with longer histories and less interest in moving to a new community. Overall, roughly eight-in-ten Americans (79%) say they are satisfied with the quality of life in their local community, with about a quarter (27%) saying they are very satisfied. While majorities across community types express satisfaction with life in their community, suburban residents (31%) are somewhat more likely than those living in urban (23%) or rural (26%) areas to say they are very satisfied. About half in each group say they are somewhat satisfied. Community satisfaction varies across key demographic groups, with whites voicing higher levels of satisfaction than nonwhites, and older adults and college graduates among the most likely to say they are very satisfied with life in their community. These patterns can be seen across suburban and rural areas but are less consistent in urban areas. For example, among those who live in a suburb, 35% of white residents and 24% of nonwhites say they are very satisfied with life in their community. And among rural residents, whites are about twice as likely as nonwhites to say they are very satisfied (30% vs. 16%). In urban areas, similar shares of white (25%) and nonwhite residents (21%) say they are very satisfied with the quality of life in their community. Similarly, older adults (those ages 65 and older) in suburban and rural areas are significantly more likely than their younger counterparts to say they are very satisfied with life in their community. In rural areas, 43% of those ages 65 and older say they are very satisfied, compared with only 15% of those ages 18 to 29. Roughly a third (32%) of young adults in rural areas say they are very or mostly dissatisfied with life in their community; this is significantly higher than the share of young adults in suburban areas who say the same (21%). Satisfaction with community life is largely consistent across age groups in urban areas. When it comes to educational attainment, college graduates express higher levels of satisfaction across community types – with roughly a third of bachelor’s degree holders (34%) saying they are very satisfied with the quality of life in their community, compared with a quarter of those without a four-year college degree. A majority of Americans (59%) feel at least somewhat attached to their local community, but relatively few (16%) say they feel very attached. Roughly four-in-ten adults (41%) say they are not too or not at all attached to their local community. These sentiments vary widely by stage of life, time spent in the community and social connections. Interestingly, feelings of attachment do not differ markedly across community type. Nearly identical shares of adults living in urban (60%), suburban (60%) or rural (57%) communities say they feel very or somewhat attached to their local community, with about one-in-six in each type of area saying they feel very attached. Older adults feel a stronger attachment to their communities than their middle-aged and young adult counterparts, and this is true across community types. Among all adults ages 65 and older, 73% say they feel very or somewhat attached to their community. This compares with 64% of those ages 50 to 64, 56% of those 30 to 49 and 45% of those younger than 30. Of course, older adults tend to have lived in their community for a longer period of time, but even after controlling for this factor, the age pattern persists. Among adults who have lived in their community for 11 years or more, older adults are significantly more likely than others to say they are very attached to their community (32% of those 65 and older, compared with roughly one-in-five middle-aged adults and 13% of young adults). Overall, the number of years spent in a community is strongly linked with feelings of community attachment. Among those who have lived in their community for more than a decade, 69% say they feel very or somewhat attached to their community. The shares are significantly lower among those who have lived in their community six to 10 years (54%) or less than six years (44%). Social connections are also linked to community attachment. Adults who say they know all or most of their neighbors are more than twice as likely as those who don’t know any of their neighbors to say they feel very or somewhat attached to their community (77% vs. 32%). Again, knowing one’s neighbors is connected with how many years an individual has lived in a community. But even among adults who have lived in their community for more than a decade, those who know most of their neighbors express higher levels of community attachment: 81% who say they know all or most of their neighbors also say they feel very or somewhat attached to their community. This compares with 64% of those who know some of their neighbors and 47% of those who don’t know any of their neighbors. Adults who own their home express higher levels of attachment to their local community than those who rent. Roughly two-thirds (65%) of homeowners say they feel attached to their community, including 20% who say they are very attached. By comparison, 52% of renters say they are attached to their local community, including 11% who are very attached. Just over half of all adults (54%) say they have lived in their local community for 11 years or more, with 34% saying they’ve been in the same community for more than two decades. Some 14% have lived in the same place for six to 10 years. And roughly a third (32%) have lived in their community for less than six years (including 7% who have not yet been there a year). Rural residents are more likely than other adults to be longtime residents in their communities: 63% have been living in their local community for 11 years or more, compared with 53% of suburban dwellers and 45% of those living in urban areas. 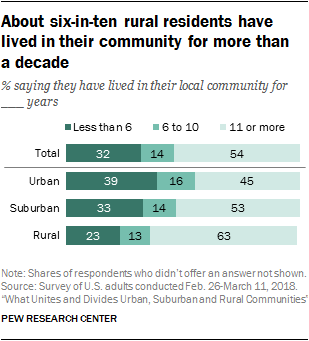 About four-in-ten rural residents (41%) have lived in their local community in excess of 20 years. Rural communities tend to have a higher concentration of older adults, which might help explain why rural residents are more likely to have lived in their communities for more than a decade. But even after controlling for age, the longevity patterns are similar. Among those younger than 50, 54% of rural residents have lived in their community for 11 years or more, compared with 38% of suburban and 32% of urban residents. Overall, about four-in-ten Americans (42%) currently live in or near the community where they grew up, including 21% who say they have always lived there and 20% who moved away at some point but have since moved back. Some 58% of adults say they do not live in or near the community where they grew up. Again, these patterns differ somewhat by community type. Rural residents (47%) are more likely than those living in the suburbs (38%) to say they currently live in or near the community where they grew up; 42% of urban residents say the same. About a quarter or less in rural (26%), urban (21%) and suburban (18%) areas say they have always lived in or near the community where they live now. These mobility patterns differ widely by educational attainment. Roughly a third of adults with a four-year college degree (32%) say they currently live in or near the community where they grew up, compared with 46% of those without a college degree. And those who don’t have a college degree are about twice as likely as those who do to say they’ve lived in or near that community their entire life (26% vs. 12%). These patterns are nearly identical across community types, with college graduates in urban, suburban and rural areas significantly less likely than non-college graduates to say they live in or near the community where they grew up. For the 21% of Americans who say they have always lived in or near the community where they grew up, family ties stand out as one of the primary motivations for staying put. Roughly a third of adults who have stayed in their communities (35%) say a desire to be near family is one of the main reasons they have done so. Others (17%) point to factors having to do with the quality of life in their community – saying it’s a good place to live and raise a family, the cost of living is reasonable, or that they like the climate, amenities, schools, or the sense of community it provides. Some 13% of adults say they’ve stayed in their community for job-related reasons, and 12% attribute their lack of mobility to simply feeling comfortable and not having any desire to leave. For some adults who have never lived outside the area where they grew up, moving to a new community is not an option; 7% say they cannot afford to move. There is very little variation across community types in the reasons for staying put. Whether they are living in an urban, suburban or rural area, more adults who say they still live in or near the community where they grew up list proximity to family than any other factor as a top reason why they’ve never left. And there are relatively few differences across key demographic groups. Whites (40%) are more likely than nonwhites (26%) to say living near family is a main reason why they have stayed in the same community. Young adults are less likely than their older counterparts to cite the quality of life in their community as a reason for staying (7% of 18- to 29-year-olds say this compared with 21% of those ages 30 and older) and more likely to say they can’t afford to move (12% vs. 5%). For the 20% of adults who moved away from the community where they grew up but eventually returned, the reasons for coming back are similar to the reasons some people have never left. Being near family tops the list, with 42% saying this is a main reason why they came back to live in or near the community where they grew up. Some 22% point to factors having to do with the quality of life in that community – such as the cost of living, climate or amenities. One-in-ten say they came back for job-related reasons and 11% say a sense of familiarity or comfort drew them back. Suburban (50%) and rural (42%) residents are significantly more likely than those living in urban areas (30%) to say they came back to the community where they grew up in order to be near family, but even for urban dwellers, family tops the list of reasons. Perhaps not surprisingly, people who live in or near the community where they grew up are more likely than those who do not to say all or most of their extended family members live within an hour’s drive of where they live (45% vs. 17%). There is a difference, however, between those who have stayed in the community where they grew up their entire lives and those who moved away and returned to the community where they grew up: 52% of those who stayed say all or most of their family members live nearby, compared with 38% of those who moved and later returned to live in or near where they grew up. This pattern is consistent across urban, rural and suburban communities. Overall, a majority of Americans (55%) say at least some members of their extended family live within an hour’s drive from them, including 29% who say all or most of them do. Rural Americans are somewhat more likely than their urban and suburban counterparts to say all or most of their family members live within an hour’s drive (33% vs. 26% and 27%). In turn, about one-in-five urban (23%) and suburban (21%) dwellers say none of their extended family members live near them, compared with 15% of those in rural areas. Among the majority of Americans who no longer live in or near the community where they grew up, those who grew up in the suburbs are most likely to have landed in another suburban community. Some 57% of adults who grew up in the suburbs and say they no longer live in the community where they grew up currently live in a suburb. Adults who grew up in an urban area but moved away are about equally likely to now be living in a city (40%) or a suburb (35%). Only a quarter have ended up in a rural area. Similarly, those who grew up in a rural area but no longer live in the community where they grew up are most likely to be living in a suburb (40%) or a rural area (38%). About one-in-five (22%) of these former rural residents now live in an urban area. When asked if they would move to a different community if they could, 32% of adults say they would want to move. An additional 31% say they are not sure if they would want to move and 37% say they would not move. The desire to move differs across community types, and again there is a strong indication that rural residents are more firmly rooted in their local communities. Urban (37%) and suburban (34%) residents are significantly more likely than those living in rural areas (25%) to say they would move if they could. Some 43% of rural residents say would not want to move away from their current community. Not surprisingly, young adults stand out in terms of their desire to move. Among those ages 18 to 29, 43% say they would want to move to a different community if they could. By comparison, 35% of those ages 30 to 49 and 29% of those 50 to 64 say the same. Only about one-in-five adults ages 65 and older (18%) say they would like to move. These age patterns for the most part hold up across community types. In suburban and rural areas, young adults are significantly more likely than middle-aged or older adults to say they would like to move if they could. In urban areas, there is not a significant gap in the desire to move between those ages 18 to 29, 30 to 49 or 50 to 64. Across all three community types, older adults are the least inclined to say they would like to move. Attachment to community and connections with neighbors are strongly linked to feelings about moving. People who say they are not too or not at all attached to their community are about five times as likely as those who feel very attached to say they would like to move to a new community (50% and 11%, respectively). Similarly, those who say they don’t know any of their neighbors are about twice as likely to say they would like to move as those who know all or most of their neighbors (50% vs. 23%). The desire to move doesn’t necessarily translate into an ability to do so. Roughly one-in-five of those who say they would like to move to a different community if they could say it is not too likely (13%) or not at all likely (5%) that they will move. About half (52%) say it is very likely they will do this at some point in the future, and an additional 29% say it is somewhat likely. Urban residents who say they would like to move are more likely than those living in suburban or rural areas to say this is probably going to happen (61% in urban areas say it’s very likely they will move at some point, compared with 49% in the suburbs and 47% in rural areas). About three-in-ten adults who say they are not interested in moving to a new community say there’s a chance they may do so anyway. Some 8% say it’s very likely they will move at some point in the future and 23% say it’s somewhat likely. People who do express an interest in moving don’t necessarily want to move to a different type of community. Roughly four-in-ten suburban residents who would like to move (41%) say they would move to another suburban area. Some 35% say they would move to a rural area, and 23% would like to move to a city. The pattern is similar for rural residents who say they would like to move if they could. Four-in-ten say they would move to another rural community. Roughly the same share (39%) say they would move to a suburban community, while fewer (20%) say they would move to a city. Urban residents who would like to move are somewhat less inclined to say they would go to another urban area – only 28% say so. Some 41% of city dwellers say, if they could, they would move to a suburb and 30% say they would move to a rural area. In deciding where to live or assessing the quality of life in their current community, Americans have a variety of factors to consider – from outside activities to culture to racial and ethnic diversity. For a majority of Americans – across community types – living in an area that is a good place to raise children is a high priority. About six-in-ten Americans in urban (57%), suburban (63%) and rural (59%) areas say it is very important to them, personally, to live in a community that is a good place to raise children. Smaller shares say the same about living in a place with access to recreational and outdoor activities (42% overall), where they have family nearby (38%) and where there is a strong sense of community (27%). Roughly one-in-five (22%) say it is very important to them to live in a place that is racially and ethnically diverse. Fewer place a high level of importance on living in a community where most people share their religious (11%) or political (8%) views. 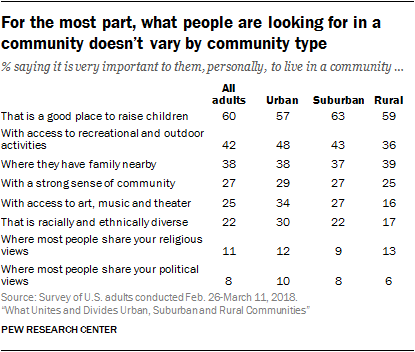 For the most part, views about what is important in a community vary modestly, if at all, across demographic groups, but there are some exceptions. For example, across community types, women are far more likely than men to say it’s very important to them personally to live in a community where they have family nearby: 45% of women in urban and suburban areas and 48% in rural areas say this is very important, compared with about three-in-ten men in each type of community. In urban, suburban and rural areas, those with a bachelor’s degree or more education are more likely than those without a college degree to say it’s important to them to live in a community with access to art, music and theater. This is particularly important to urban college graduates: 47% in this group say this is very important to them, compared with 28% of non-college graduates in urban areas, 36% of college graduates and 21% of non-college graduates in the suburbs, and 23% of college graduates and 14% of non-college graduates in rural areas. In urban areas, nonwhites place a higher premium than whites on living in a community that is a good place to raise children: 64% of urban nonwhites say this is very important to them, personally, compared with 49% of their white counterparts. There are no significant differences between whites and nonwhites on this item in suburban or rural areas, however. While relatively few Americans overall (22%) say it is very important to them personally to live in a community that is racially and ethnically diverse, a majority (59%) see this as at least somewhat important. This is particularly the case in urban areas, where 70% say it is very or somewhat important to them, personally, to live in a community that is racially and ethnically diverse, compared with 59% of those in suburbs and 52% of those in rural areas. Across community types, nonwhites are more likely than whites to say living in a place that is racially and ethnically diverse is important to them. For example, while about seven-in-ten nonwhites in rural communities (71%) consider this at least somewhat important, only 46% of rural whites feel the same way. There are also large partisan gaps when it comes to this item. Overall, three-quarters of Democrats and Democratic-leaning independents (including 80% in urban, 77% in suburban and 67% in rural areas) say it’s important to them, personally, to live in a place that is racially and ethnically diverse; about four-in-ten of all Republicans and Republican-leaning independents say the same (44% in urban, 36% in suburban and 39% in rural communities).